The whole egg separation thing is such a palaver and even if you manage to get a lovely saucer of plump yolks and a clean bowl of whiskable whites, you still have to find something to do with the parts of the egg that you don’t need for the recipe. “Make mayonnaise!” suggests Google. “Use the yolks for a Hollandaise or to make homemade ice cream!” I’ve just spent an hour separating eggs into a series of eight different bowls for fear of contaminating a bulk-load of whites; do you really think I can be arsed to now make Hollandaise? Anyway, all of these issues are in the past for I have made the greatest culinary discovery: egg whites in a carton. Ready separated, pourable egg whites. Thank you so much to the readers who recommended the Two Chicks brand last year; I hadn’t ignored your advice, I was just waiting until the right time to buy them. Which was Christmas – prime pavlova-making time. (Nigella’s Prodigious Pavlova to be exact, recipe and pictures to follow.) To use the Two Chicks egg whites you just pour two tablespoons out for each white that you need and then put the carton back in the fridge. The remaining whites last for a week or so, plenty of time to add them to an omelette or what have you, though I just made a whole load of meringue and then froze a batch of them for later. You can never have too many meringues in the freezer – instant dinner party pleaser! So: Two Chicks. Life changing, at least in terms of the kitchen. Those who are good at separating eggs may sneer and tut and they are welcome to carry on with their perilous yolk-pouring antics, but I am a Carton Convert. 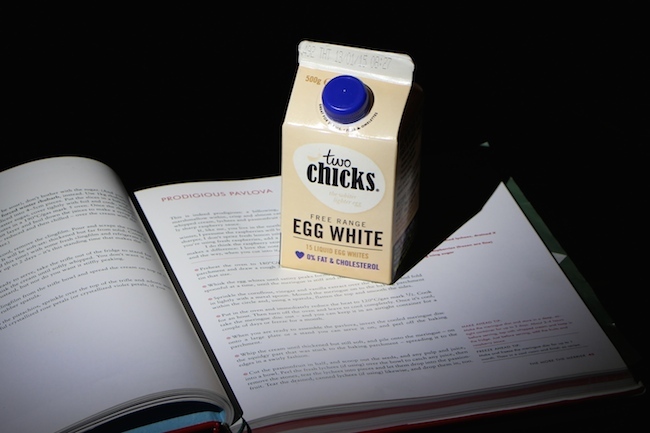 You can find Two Chicks egg whites at most supermarkets – I got mine at Tesco but all the stockists are here. Next Post A Natural Deodorant that’s not the Absolute Pits.